A 44-year-old Zimbabwean man from Beitbridge was found lying dead in a pool of blood at a bush in Musina, South Africa after he was allegedly stoned to death in a suspected xenophobic attack. Lieutenant Mudau confirmed the incident, which is suspected to have occurred on Friday night at Matswale Extension 9 suburb in Musina. The body was found on Saturday at around 6am by a passerby who then alerted police. Lt Mudau said they have since opened investigations. He identified the man as Cephas Mulaudzi, who was employed at a game reserve outside Musina. "We have since launched investigations following the discovery of a body of a man whom we suspect was murdered and dumped in the bush near Matswale Extension 9 suburb. The body of the victim, who is a Zimbabwean, was discovered by a passerby who then alerted us. He had visible head and chest injuries an indication that he was stoned to death," said the police spokesperson. Matswale has of late become home to Zimbabweans living in Musina. Lt Mudau said no arrests were made, adding that investigations were going on. "As police, we are also appealing to anyone who might have information that could lead to the arrest of the suspects to contact us," he said. The body was taken to Nzhelele Government mortuary for a post-mortem. Several Zimbabweans living in South Africa have in the past fallen victim to xenophobic attacks at the hands of locals. In June 2011, a Zimbabwean man, Mr Godfrey Sibanda, was cornered by a mob and stoned to death in Extension 75 of Seshego Township, northwest of Polokwane, while walking home from work. 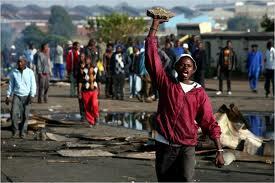 The fracas also resulted in scores of Zimbabweans fleeing their homes. In May 2008, 62 people among them Zimbabweans were left dead and more than 100,000 displaced and property worth millions of rand looted or destroyed during xenophobic attacks on foreigners, which started in Alexandra Township in Johannesburg before spreading to other parts of the neighbouring country.